Amsterdam Holland Pass Discounts 2019 - The #1 City Pass! Amsterdam Holland Pass is a discount card that offers free access to most of the (major) museums and attractions in Amsterdam. It can be used in other cities as well; Rotterdam, The Hague and Utrecht. This card is perhaps the best option to save money on museums and attractions when you are in Amsterdam for a short visit (2-5 days). Major museums as the Rijksmuseum, Stedelijk Museum, Van Gogh Museum but also popular attractions like Heineken Experience, Keukenhof Garden, Madame Tussauds and canal tours are included in the Amsterdam Holland Pass. This discount pass is valid for one month after first use. The Amsterdam Holland Pass can be bought online. After completing your purchase online you will receive a confirmation voucher that you can redeem at the selected pick-up point. The Amsterdam Holland Pass lets tourists make a choice based on the number of museums or attractions they would like to see during their stay in Amsterdam. 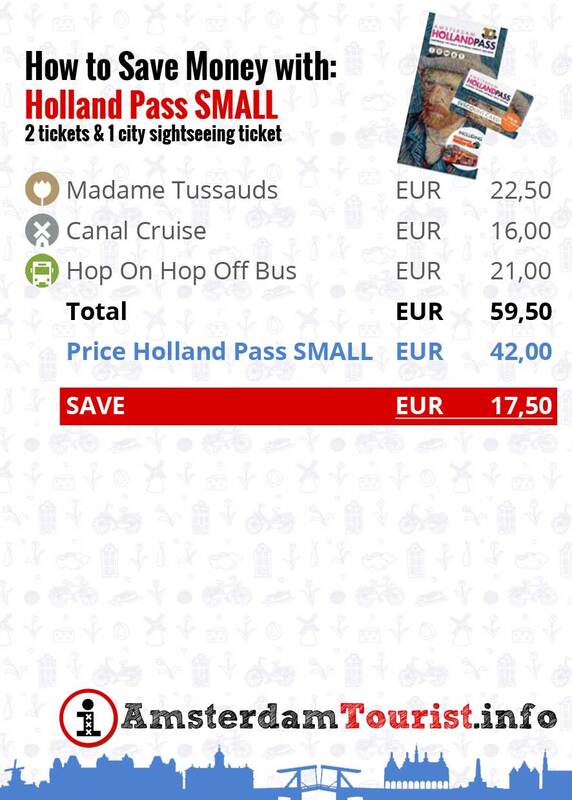 If you have used all of your coupons, you are still able to save money on museums and attractions with the discount card included in the Amsterdam Holland Pass Package and even 20% discount on a lot of country side tours. There are two different coupons/tickets included in every Amsterdam Holland Pass: a ‘GOLD TICKET and a ‘SILVER TICKET’. The ‘GOLDEN TICKET’ can be used as a free entrance ticket at one of the museums or attractions (listed). With the ‘SILVER TICKET’ you have free access to a limited number of museums and attractions. These are mostly museums and attractions with a cheaper entrance price. Please note that in every Pass only the first GOLDEN ticket is valid for the Rijksmuseum. In this pdf file Amsterdam Holland Pass 2017 ticket overview overview you can find an overview which museum/attaction accepts the GOLDEN or SILVER ticket. BUY YOUR CITY PASS HERE! When you buy the Amsterdam Holland Pass, you receive a full-color guide book (6 languages: English, Dutch, German, French, Italian and Spanish). In this handy guide book you will find comprehensive information on each museum and attraction, helpful city maps, shopping tips, restaurant recommendations and other special offers. Good to know: every version has 1 special GOLDEN ticket that is valid at all museums and attractions, including Rijksmuseum. Other GOLDEN tickets in the package do not offer free entry at the Rijksmuseum! Per version, you can only visit the Rijksmuseum once. Where to buy the Amsterdam Holland Pass? Widely recognized, great coverage inclusing free entry at Rijksmuseum. Can be purchased with a wide variety of options and is valid for one month after first use. Cheaper than the I amsterdam City Card. Discounts or free gifts/drinks at restaurants and shops. I am planning to visit Holland with my son who is 20 years old from March 22 to 29, 2018. We are a group of 5 adults travelling to Amsterdam in the month of May 2018 between 22 to 26. We want to travel to Geithoorn and stay for a day before settling in Amsterdam. Our base of stay after Geithoorn will be Haarlem and so will be travelling everyday to the central and other places. Other places include, zaanse schans, volendam, marken, hague, delft. Within Amsterdam we would like to explore as much as possible including museums, red light area and other attractions. We were assuming that I Amsterdam card will cover all the transportation and entry to museums. Suddenly, I have come across Holland Pass and Regional transport pass – so very confused which one to opt in order to cover our entire tour including site seeing, entrances and public transportation within Amsterdam and to other places mentioned above. How much discount of Amsterdam & Region Travel Ticket I can get if I use Holland Pass? I will spend 4 whole days in the Netherland. I will live in somewhere near Sloterdijik station and am going to Keukenhof, Giethoorn, Het Nationsle Park De Hoge Veluwe and Rotterdam + Kinderdijk. The transporation makes me so confused. Do you think if I buy a Holland Card, it should be the least expensive way?Could the Holland Card be used everywhere in the Nederland on train (including Sprinter, Intercity), bus, tram, boat? Where I can buy? If I buy 4 consecutive days, would the price be reduced? I am traveling to Amsterdam on 8th to 11th May. I am thinking of buying the medium Holland Pass. I have gone through the website however one thing is not getting cleared. On buying holland pass will the local transport (tram, ferry etc.) become free for me for all the 4 days of my stay? Also is canal cruises free with this medium pass? Is this valid for 2017 ? Dear Sorin, the free transfer ticket is no longer available in any pass in 2017. Does the pass cover free transport between Amsterdam and Amstelveen and Amstelveen to keukenhoff? Planning to visit rijksmuseum, van gogh museum, keukenhoff and take canal cruise. Stays in Amstelveen for 3 nights. There are 5 adults traveling. Which pass should we get? Thank you in advance. Hi, with the Amsterdam Holland Pass, how do we get the entrance ticket at museum? Is there a special queue for it or we need to queue at normal line to exchange to ticket? We are planning to buy a Holland Pass Large. Can we reserve our excursions online ahead of time once we have bought the Holland Pass? I don’t see how we can do this without paying for the excursions. I am coming with my daughter who is 8 years old. Does she need her own pass as well? Im planning to visit kekenhof directly from schippol airport, does holland pass cover transportation to kekenhof from schipol and return also? Hi, we are 3 friends and we are planning a plan on 27 april in amsterdam. We would like to go Anne Frank House, a canal cruise, Heineken Experience, Vondelpark, Dam Square, Red Light District and also cycling tour. Would you prefer which card is suitable for us? Also we want to go Bruge and Bruksell from Amrterdam – train or bus? Which card do we buy to this transport? Regarding your visit to Bruges or Bruxelles; just a day trip or you you ant these cities after your visit to Amsterdam? We are a family of four. If we all want to visit the Rijksmuseum and the Van Gogh museum, and three of us will go to the Stedelijk, how many Amsterdam Holland passes would you buy? The Amsterdam Holland Pass is a personal pass, so each family member has to buy one. Hi – I will be visiting Amsterdam for 1 full day on May 19th, arriving the night before and leaving the morning of May 20th. 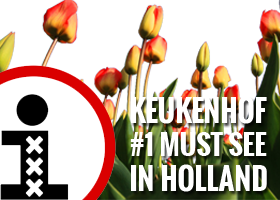 I am interested in visiting the Anne Frank House, Keukemhof (not a tour), Rijksmuseum, Van Gogh Museum, Canal cruise and/ or hop on hop off, Red Light district walking tour. Is this an ambitious schedule? What Holland pass would you recommend?. I was thinking of starting with the Keukemhof arriving at 8am when it opens. Any suggestions on how to organize the day would be greatly appreciated. Hi – I am visiting Amsterdam for 1 full day on May 19th arriving the night before and staying 2 nights. I would like to go to the Anne Frank House, Keukemhof (on my own), Rikjsmuseum, Van Gogh Musuem, Canal cruise and Red light district walking tour. Is this an ambitious schedule? What is the recommended holland pass? Would appreciate your suggestion on order of events. Thinking of starting with Keukemhof since the gardens open at 8am. Many thanks. Hi there. I think you are trying too much in 1 day. It is very late in the season for Keukenhof so not as spectacular as earlier in the season and really will take up most of your day. My advise is rather do the things you have planned for central Amsterdam and do Keukenhof on another trip. My husband and I will be in Amsterdam from March 27th to the morning of 30th. If we have the time, we would like to do/visit the following: Van Gogh, Anne Frank, Rijksmuseum, Muiderslot and Keukenhof. Maybe a canal cruise if we can. What would be the best card to get? It seems like the Holland Pass- but the Silver/Gold/Large/Small is a little confusing. Any help or recommendations are welcome! My wife and I will be visiting Amsterdam in April for 5 days. We would like to go to the Rijksmuseum, the Van Gogh Museum, Keukenhof, the Anne Frank House, Kinderdijk and also do a canal cruise and possibly cycling. We will also need to use public transport in the city. Which option would be better for us? Does this pass cover the Mauritshuis in Den Haag ? Hello, sorry I have one more question, with Amsterdam Holland Pass you also have to reserve a precise day/ hour slot to visit Van gogh museum and Keukenhof? Or you just go there and with fast track you enter? Hi Vera, with the GOLDEN tickets from the Amsterdam Holland Pass you have access to Van Gogh Museum and Keukenhof via the Fast Track Entry. In fact Holland Pass does not allow you fast track access to Van Gogh Museum as at April 2017. You still join the same queue as others for getting tickets. Just that the others pay by cash etc and you pay by the gold ticket. Does the Holland Pass include public transportation (trams, subway. buses) within Amsterdam? You can buy a 24 hrs Public Transport Ticket (GVB) with one SILVER coupon from the Amsterdam Holland Pass. also providing fast track entry ? Yes, you can buy tickets online with 10% discount and have a fast track entrance. For example you can buy the tickets for the Van Gogh Museum with the link I provided in an earlier answer (see below). So you have to go to the website of the Van Gogh Museum to buy theses tickets and select the special 10% discount Holland Pass tickets. Dear Jan, many thanks for your reply. So far I understand Gold Ticket provides free access, fast track entry and not limited for a certain time. What about the 10% discount tickets- can I book them online (10%discount) for a certain time but also providing fast track entry ? I hope I dont bother you with my detailed questions. 1 st. Question:We are a group of 9 persons from Berlin planning a 4 day tour , 3 of us have a incapacity (variety form 50% to 90%).Do this people get reduced tickets for museums etc. And if so, can I book the reduced tickets online in advance? 2nd question: Do I have with the Holland Amsterdam Pass 5 free access for the Van Gogh museum and the Rijksmuseum as well ? As of my knowledge most of the museums don’t have any reduction for people with a disability. The only reduction for museums I know are for students or for older people (+65 years). Thanks for this information. So I have two question more: Do older visitors (65+) get reduced prices for the Holland Amsterdam Pass or the City Card ? Includes the small Amsterdam Pass free entrance for the Rijkes Museum and the Van Gogh Museum ? I’m sorry to inform you that older Visitors (65+) don’t get any discount for the Amsterdam Holland Pass or the iamsterdam City Card. With the Amsterdam Holland Pass SMALL you get 1 free entrance ticket (GOLD) for either the Rijksmuseum or Van Gogh Museum, not noth. But you can use one ticket for the Rijksmuseum and you can still use the discount card included with the Amsterdam Holland Pass for a 10% disocunt at the Van Gogh Museum. Combination Deal – Save More on Tickets!